[140 Pages Report] This research study involved the extensive usage of secondary sources, directories, and databases such as Hoovers, Bloomberg Businessweek, and Factiva to identify and collect information on the drone simulator market. Primary sources included experts from core and related industries, and preferred suppliers, manufacturers, solution providers, technology developers, alliances, and organizations related to all segments of the industry’s value chain. All primary sources have been interviewed to obtain and verify critical qualitative and quantitative information as well as assess prospects for the growth of the drone simulator market during the period under consideration. The market share for companies was determined on the basis of secondary data made available through paid and unpaid sources and analysis of product portfolios of major companies, and then rating them on the basis of performance and quality. These data points have been further validated by primary sources. The secondary sources referred for this research study included sources, such as Airbus and Boeing Aircraft Market Outlook, ICFI Aerospace Outlook, Federal Aviation Administration, and Avalon World Fleet Forecast; corporate filings, such as annual reports, investor presentations, and financial statements; and trade, business, and professional associations, among others. The secondary data has been collected and analyzed to arrive at the overall market size, which has been further validated by primary respondents. Extensive primary research has been performed after acquiring knowledge about the drone simulator market scenario through secondary research. Several primary interviews have been conducted with market experts from both, the demand- and supply-side across major regions, namely, North America, Europe, Asia-Pacific (APAC), and Rest of the World (RoW). The primary data has been collected through questionnaires, mails, and telephonic interviews. The top-down and bottom-up approaches have been used to estimate and validate the size of the drone simulator market. The following figure in this subsection is a representation of the overall market size estimation process employed for the purpose of this study. Key players in the market have been identified through secondary research, and their market shares have been determined through primary and secondary research. This included a study of annual and financial reports of top market players and extensive interviews with leaders, including CEOs, directors, and marketing executives. All percentage shares, splits, and breakdowns have been determined using secondary sources and have been verified through primary sources. All possible parameters that affect the markets covered in this research study have been accounted for, viewed in extensive detail, verified through primary research, and analyzed to obtain the final quantitative and qualitative data. 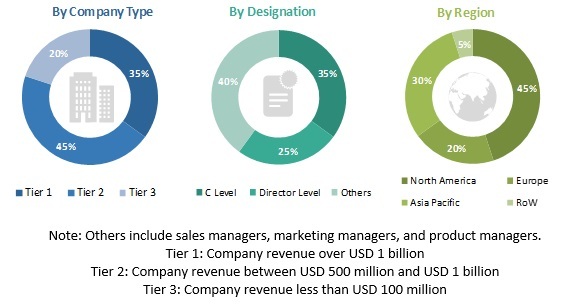 After arriving at the overall market size from the market size estimation process, the total market has been split into several segments and subsegments. In order to complete the overall market engineering process and arrive at the exact statistics for market segments and subsegments, data triangulation and market breakdown procedures explained below have been implemented, wherever applicable. The data has been triangulated by studying various factors and trends from both, the demand- and supply-side. Along with this, the market size has been validated using both, top-down and bottom-up approaches. The drone simulator market is projected to grow from an estimated USD 376.9 Million in 2017 to USD 764.7 Million by 2022, at a CAGR of 15.20% from 2017 to 2022. The growth of the market across the globe can be attributed to the growing demand of drones for commercial and military applications. Due to the increasing number of drones, the demand for trained pilots is also growing, which will, in turn, fuel the growth of the market. The drone simulator market has been segmented on the basis of component, device type, drone type, platform, system, and region. Based on platform, the market has been segmented into commercial and military. The military segment is projected to lead the market owing to the affordability of drone simulators for training of military pilots and operators, as compared to live training using real drones. 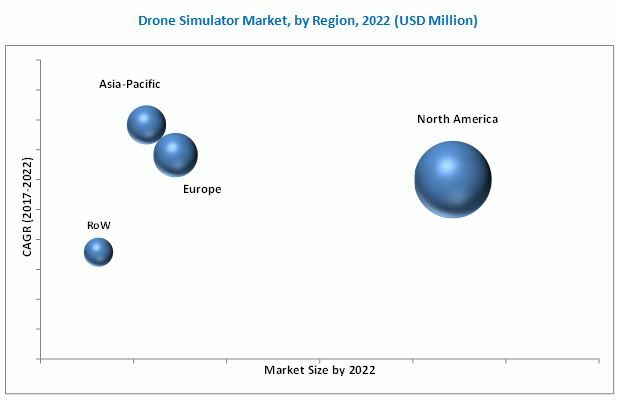 The drone simulator market has been studied for North America, Europe, Asia-Pacific, and Rest of the World (RoW). The North American region is estimated to be the largest market for drone simulator in 2017. Countries in this region, such as the US and Canada, are witnessing an increase in the adoption of simulators in the drone industry. The market in the European and Asia-Pacific regions is also expected to witness a high growth due to the rising use of drone simulators for gaming applications, such as drone racing. Major companies profiled in the report include CAE Inc. (Canada), Israel Aerospace Industries Ltd. (Israel), L-3 Link Simulation & Training (US), Leonardo S.p.A. (Italy), and Zen Technologies Ltd. (India), among others. Acquisitions and new product launches were the key strategies adopted by the leading players in the drone simulator market from 2012 to 2017. These strategies have enabled companies to strengthen their position in the market.